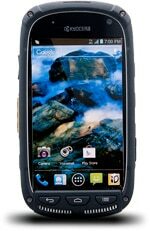 The Kyocera Torque E6710 is a rugged Android smartphone with NFC. The 4-inch screened device runs Android 4.0, is waterproof and meets the IP67 rating for dust and water immersion. The Torque launched in March 2013 and is available on the Sprint network in the US. Engadget has a detailed review of the phone.